Working in a coal mine could be a very dangerous job. Accidents occurred every day, yet were not always recorded because they were so common. Frequent accidents were due to roofs collapsing in the mine workings or explosions from dangerous gases underground. Download the flame safety lamp worksheet to find out more about how the problem of explosive gases was dealt with. Huskar Pit was a coal mine in the village of Silkstone Common, near Barnsley. On 4 July 1838 a terrible disaster occurred. The day started hot, bright and sunny but from about 2pm a violent storm raged. Heavy rain fell and nearby streams began to flood. The rain put out the boiler fire of the steam-powered winding engine so workers underground could not be lifted out of the pit. This meant that just over 40 children, aged between 7 and 17 years old, along with some of the men, were trapped underground. A message was sent for the miners to make their way to the pit bottom, and wait for the boiler to be re-lit, to allow them to be lifted out. Those working underground were unsure about what was happening. Some thought there was a fire underground or on the pit top. Some people mistook a clap of thunder for an explosion. By this time the children had spent nine hours in darkness and they were desperate to leave. Fearing for their lives, the children panicked. They ignored advice to stay where they were and attempted to reach the surface by walking out along the drift in Nabbs Wood. (A drift is a sloping tunnel leading to the surface; sometimes called a 'day hole'). As the terrified children tried to make their way to safety, a stream swollen by the heavy rain overflowed into the drift. The children were washed off their feet and down to the ventilation door through which they had just passed. The water rose and 26 children drowned. 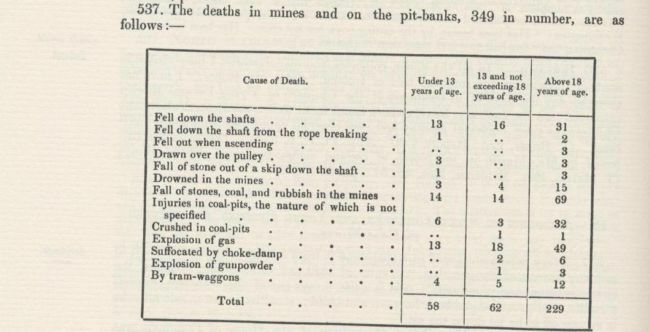 The majority of those who died were under twelve years old. Fourteen children managed to fight their way through the water and survived. The inquest into the disaster was held at the Red Lion Inn, Silkstone by the Sheffield Coroner, Mr Badger. After hearing all of the evidence and the accounts of the survivors, the jury returned a verdict of ‘accidental death’. 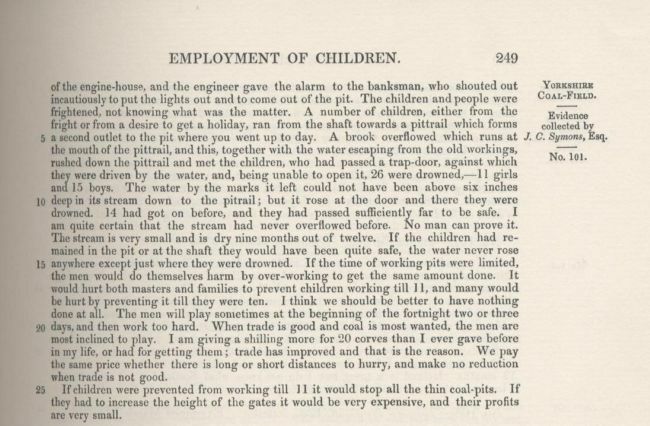 Shortly after this tragic event, Queen Victoria set up a Royal Commission to enquire into women and children working in coal mines. 1. 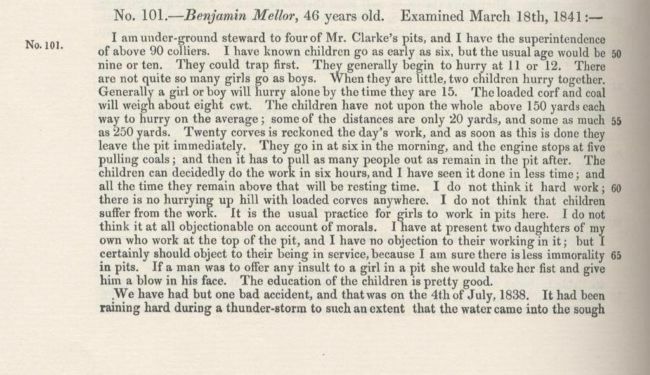 What job did Benjamin do at Mr Clarke’s pit? 2. What members of Benjamin’s family also work in the pit? 3. As well the clap of thunder that the children heard, what else probably made them frightened? 4. Would the children have known that there was a possibility that the stream might have overflowed? 5. How does Benjamin think that the tragedy could have been prevented? Download the Huskar Inquest Lesson worksheet for ideas on how to recreate the inquest in your classroom.